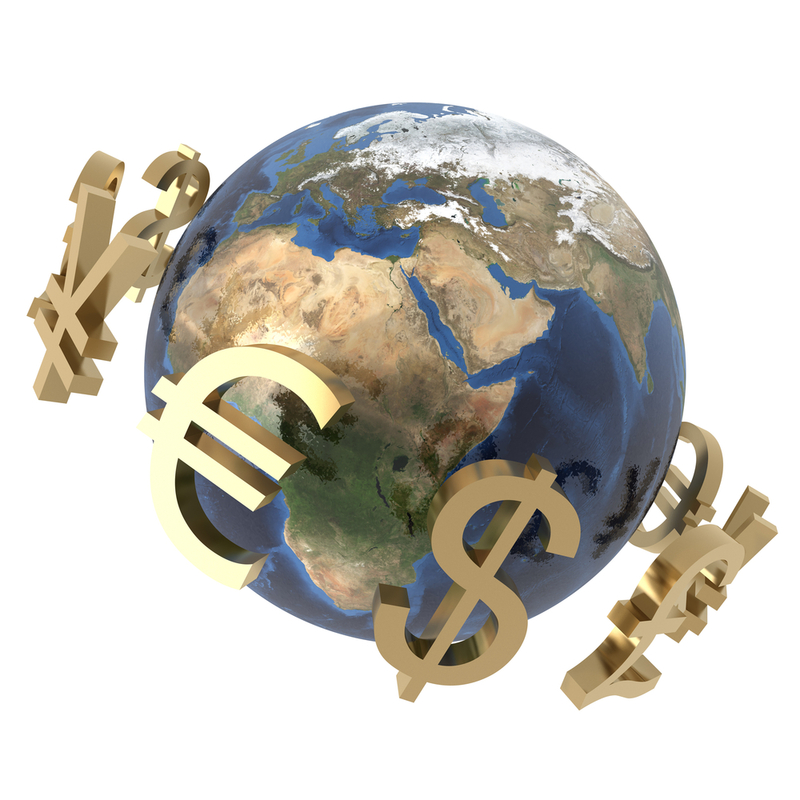 The introduction of a single "World Currency" is an idea that has been growing and looms as a real possibility in the near future. Many of us see this as a major part of the "endgame" or something that will constitute a needed reset to a global economy that has gone off track. Throughout history, prior to an economic collapse, the masses and society tend to believe it is financially stable. Only after the economy is in a freefall over the edge of an abyss does reality set in. It is not by accident that blinders have been placed upon us but it is the result of distractions being thrown in our path by those wishing to hold onto their power over us. It is wise to remember that when things do become critical, those in power will not be kind to us but that we will be thrown under the bus without a thought. Over the last one hundred years, equity markets have been a primary tool used by the public to measure the economy. When markets rise even in spite of negative fiscal indicators, the masses become optimistic. In many ways, the stock markets have become a kind of switch the elites can push at any given time to energize the masses distracting them from the dangers lurking in their economic future. During every upswing of stocks the elites claim they see the "green shoots" of prosperity, however, these shoots seem to always turn brown and die. In fact, we have been leaping from one recession to another even though central banks claim they now hold the key to generating true and honest growth. The truth is the current stock market bolstered by easy money and stock buybacks is a poor reflection of the real economy and what is happening in many homes across a broad swath of America. History indicates that establishment economists trained and educated in the ivory towers of academia are perhaps the most useless of all analysts and perpetually wrong. Only independent analysts have ever been able to predict anything of value when it comes to our economic future and that is because they have the advantage of not being blinded by the propaganda and brainwashed by lies flowing from those in control. Time and time again it has been proven the appearance of prosperity means nothing if the fundamentals do not support the optimism. A bullish stock market, a high dollar index and a low unemployment mean nothing and are unsustainable if generated by false methods and fiat money. As we have seen throughout history fundamentals matter and the markets cannot hide from true price discovery forever. The stock market with its boom and bust cycles has proven to be a false indicator of what is really unfolding. Manipulation by the central banks has even rendered this indicator of economic health as useless. The problem we face is the horrible options in fiat money, massive debt, and the growth of international businesses have all come together in an explosive way. The banking elites are positioning themselves to avoid blame for this disaster while the rest of us are being sold on the most elaborate recovery con-game ever conceived and perpetuated by those with the most to gain. They have indicated to the public their desire for an institution of a truly global centralized economic system and a highly controlled world currency framework dominated by a select cult of banking oligarchs. This in effect makes the rest of the human race their slaves. 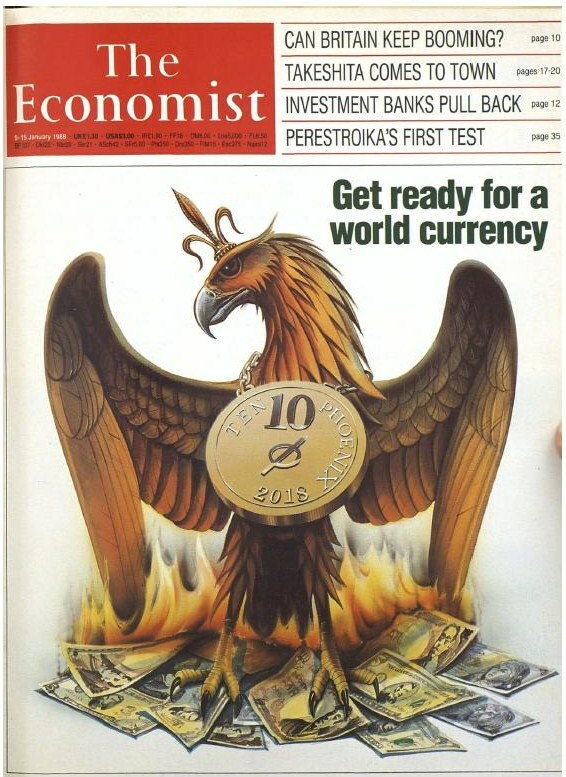 A recent article referred to a 1988 write-up in the financial magazine 'The Economist' titled “Get ready for a world currency by 2018.” It outlined the framework for a global currency system administered by the International Monetary Fund. This new system was and is floated on the premise that only by erasing all national economic sovereignty can true stability be obtained. It requires governments to borrow from the world central banking authority, rather than printing currency in order to finance their infrastructure programs. This dovetails with efforts to create such a system under the total control of the IMF which should raise the concern of every American. It comes at a time when we have been warned and seen in recent months a hard push to destabilize the dollar as the reserve currency by China and several other countries. For years the IMF has been openly discussing the ascension of the SDR to replace the dollar as the world reserve currency. Many developing nations that are deep in debt are already asking for help from the IMF due to volatility across the world and the BRICS are pushing hard to remove the dollar as the world reserve. This makes it a question of when such a currency reset will occur and in its wake bury the majority of the middle-class and poor throughout America. There is no way around it, the elites are positioned and merely waiting for a geopolitical disaster or catastrophe so overwhelming that when the time arrives they can portray themselves as the rescuing heroes in the midst of chaos. The demise of the dollar harkens back to when President Nixon severed its tie to gold. First, it’s crucial to understand that at the very core of our global economy is a financial system dominated by the U.S. dollar which has been deemed the reserve currency. The USD is unique in that it grants the U.S. the privilege of having a national currency which at the same time serves as the global reserve currency. This was solidified toward the end of World War II with the Bretton Woods agreement, which was accepted because the U.S. agreed to offer sovereign nations holding dollars a right to exchange these dollars for gold at a fixed price, however, with Nixon's action in 1971 the USD became a fiat currency backed by nothing, the supply of which can be arbitrarily altered and manipulated by a group of unelected bureaucrats in charge of the Federal Reserve. This money system represents the most powerful tool on the planet. The new world order and globalization which has been pushed by many world leaders and the rich elite touting that "larger, more cooperative governments under one financial unit will benefit us all” plays into the world currency scenario. Many Americans are oblivious to the fact we gain a great deal by our status of the dollar being the reserve currency by which all others tend to be measured. This means we have a great deal to lose if it is dethroned and stand to suffer the most if the dollar declines in value. Those who will be crucified are the middle-class Americans whose wealth is locked into or are holding long-term USD bonds thinking they are a safe investment. Currently, a huge mismatch exists between the use of the dollar in the global financial system and the U.S. share of the world economy. This is why China, Russia, and several other countries that are acutely aware of this have been taking major steps to transition to a more multi-polar currency world. This is also why we should prepare and expect that in coming years the world will adopt a completely different global financial system from the one chaotically birthed in the 1970s and when this occurs the USD will lose its total dominance on the world stage, resulting in major implications for America. While many people see this coming, several opinions exist as to how it will unfold and while we engage in speculation, nobody really knows what the world financial system will look like in ten or twenty years down the road. Few of us who continue to cherish freedom can get excited about transitioning away from the USD and being placed under the thumb of the IMF or an oppressive nation-state currency controlled by a country like China. That is why many of us think the dollar will be ripped from us during a time of crisis when Americans are open to accepting any solution offered to them as a way to ease their woes. While people point to cryptocurrencies as an option we should remember politics plays a massive role in how this all unfolds. To Americans the fate of dollar dominated assets and their value when the dust finally settles is a big concern. It is my contention the transition will take a far greater toll on paper assets than tangible goods. While recognizing the flaws of the dollar and our current system I have come to believe the other currencies such as the euro and yen hold even less merit. Regardless, and in the end, we should expect to be told and not given an option as to what is coming. Would it make a world currency "palatable" if it was voluntary? As in, people were free to use it, much as people in other countries use the dollar to retain purchasing power? An oft repeated fact is that the US has 5% of the world population and uses 25% of the world's resources. This has been true for a long time. Currently world "reserves" in dollars is about 60% of total central bank reserves. 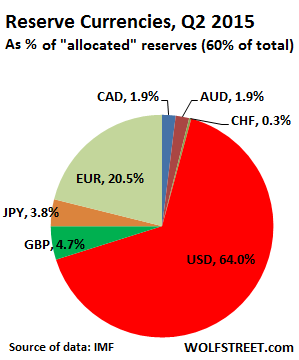 World reserves of the created SDR is a vanishingly small part of the total and it is a grab bag of 5 important currencies but I don't think includes the ruble or rupee, or any African or South American currency (Brazil, Argentina, etc.). You are exactly correct that if that were to change the percentage of dollars necessary for international reserves would fall and have some bad inflationary (and deflationary) effects in the USA. Could the debt system weather it? When it collapses (seizes up? )as many of us know it will have to do eventually, what would be the probable effects? What happened in the Soviet Union when the ruble collapsed? How much value did it lose? The official exchange rate in 1990 was 1 to 1 but it was nonconvertible. Now I believe the ruble is 56-1 with some "adjustments" since then. If we assume just a 10-1 "adjustment" then Millionaires become effectively one hundred thousandaires and are effectively returned to the work force or the die off quickly population pool. To take my meager but sufficient savings away will make the "comfortable" class similar to the poor. The bottom 60% of the US population has no savings and will be making their hand to mouth way they always have. But the real question is how trustworthy is an international currency? Why really should it have any value at all? As a composite, I doubt it will circulate as a new currency. My probable scenario is electronic money. And then I wonder about the psychological implications of having a bank account of "dollars" that have no corresponding physical reality, such as a bill. A dollar become a no-thing. It exists solely as a permission to transact in a bank. Will this bother people or be liberating? I would argue for freedom rather than compulsion which would let me, say, buy Swiss francs or gold, and transact and save in the money I prefer. The government could allow this diversification but simply control the spread. The government right to set a wide spread or the people's right to enjoy a narrow spread could then be politically discussed rather than managed behind the scenes. Freedom is the watchword but I don't really think the government wants to allow much of THAT! An article I just published (see link below) states that any currency joining and binding states or countries together must allow for an adjustment to send back funds to its weakest part. If not eventually it will become unbalanced and fail. Euro-zone Growth Tepid - Euro Will Suffer! The lowly penny and why it should go! China Warned Of Risk From Loaning To Fund OBOR! Ukraine War Is About Money, Energy, And Power! Trump And Bezos Face Off - Clash Of The Titans!